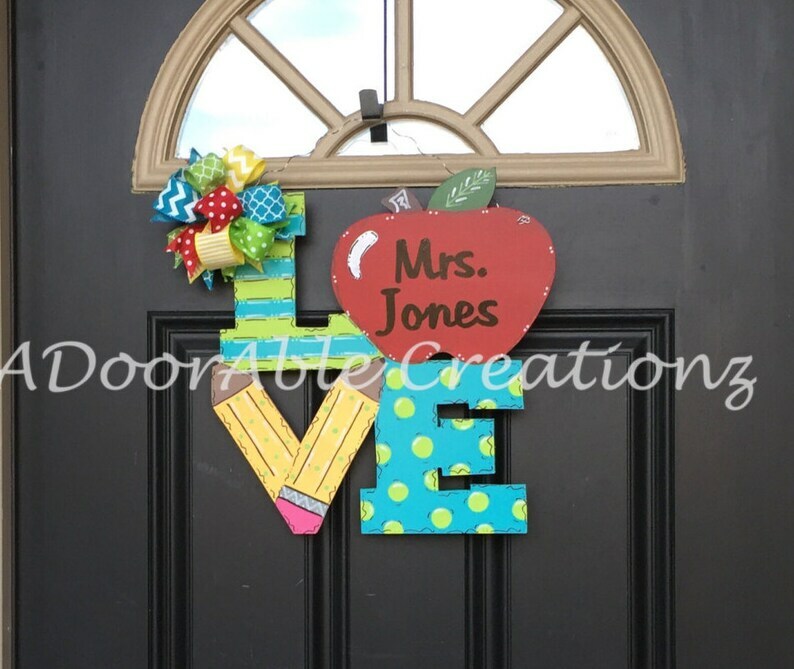 You are going to LOVE this Love Teacher Door Hanger. 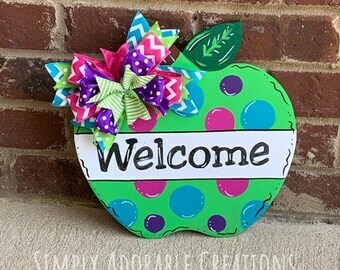 The teacher door hanger features a cute apple that replaces the traditional "O" in Love and a set of pencils to replace the V. It's perfect for back to school to decorate her classroom and it can be taken home in the summer to decorate their front door! The door hanger can be made in the colors shown or can be customized in any set of colors. When placing your order, please indicate whether to make as shown as one of the listing pictures or if you want different colors for the apple, pencils, the L or the V. Also include any personalization to add. Size 15x15. The bow is included. This teacher name door hanger is absolutely adorable and the perfect way to personalize your classroom of your favorite teacher. This sign is great for any occasion including Christmas, End of School Year, Teacher Appreciation, birthdays, gifts for newly graduating teachers. Check out our other Teacher Classroom Decor by following the link below. I bought this gift for my friend who teaches elementary school as a congratulations for getting her masters degree. I was in awe when I opened the box. The craftsmanship and design is beautiful, the colors resemble those from the pictures, and it is larger than I expected (which is a good thing). The door hanger is very nice and I highly recommend ADoorAbleCreationz!!! I can’t wait to give my friend her gift! This is so adorable outside my classroom. It's the perfect fit, custom made to match my colors. I get so many compliments and questions about where I got this sign. Thanks again!